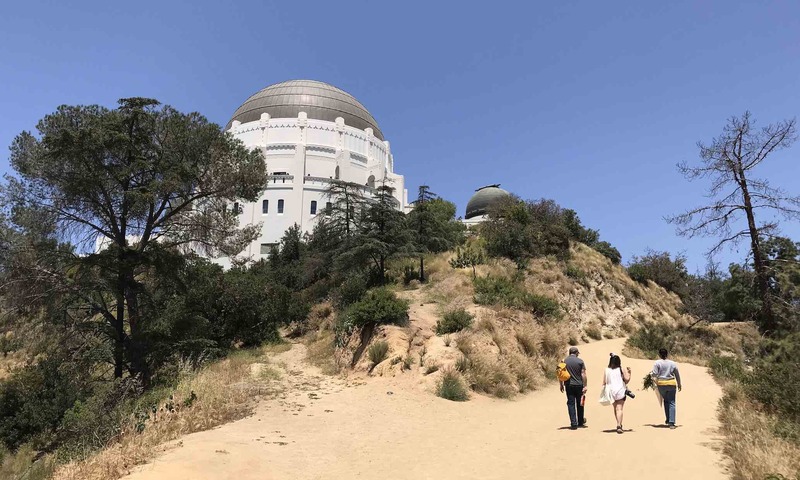 This week, from Monday, September 17 to Friday, September 21, features Griffith Observatory Sunset Walk & Talk, Left, Right & Center Live, a Twilight on the Pier concert in Santa Monica, Venice Afterburn, Friday Night Fireworks at Dodger Stadium, a Silent Disco at Alcove, and MUCH more. Hiking near Griffith Observatory. Photo by Brian Champlin / We Like L.A.
1. There’s a Doctor Who themed game night happening at Scum and Villainy Cantina. The night will include Doctor Who themed giveaways, board games, menu items and more. 2. On Monday check out a Cosmic Musings presentation and book signing event at Griffith Observatory focused on Exoplanets: the Flood of Discoveries Continues. 5. Head to the Golden Road Brewery this Monday for Trivia Night presented by Geeks Who Drink. 6. Get centered during Beach Yoga SoCal. Feel the sand in your toes, calm your senses with the sound of the ocean and do a yoga flow during sunset. Class starts at 7 p.m. and cost $15. 8. Rooftop Cinema Club returns to the rooftops of LEVEL in DTLA and NeueHouse in Hollywood with multiple screenings this week that include The Greatest Showman, Heat, Goodfellas and more. 9. 260LA is hosting a Sandro sample sale September 18-23. Score deals on the French labels mens and womens ready-to-wear, shoes and accessories . 10. E.P. & L.P. in West Hollywood continues their stylish cinema series Melrose Rooftop Theatre with a screening of Back to the Future 3, Groundhog Day and more this week. 11. Movie Nights at Tropicana Bar located at The Hollywood Roosevelt hotel will throw Angelenos a movie night series every Tuesday night from 8 to 11 p.m. from June through September by the David Hockney painted Tropicana Pool. ​Screening this week is Ed Wood. 13. Head over to Santa Monica for Twilight on the Pier. This fall a wide range of musical groups and artists will performance across different stages, transforming the pier into a festival, complete with art, a beer and spirits garden, games, and interactive activations. 15. The Super Serious Show is a comedy event produced by CleftClips featuring both established and up-and-coming talent performing an array of stand-up, sketch and musical comedy. Happening at The Virgil. 16. Join The Stalking Horse for their first beer dinner this Wednesday in their open-air back patio. Guests will enjoy a four course pairing menu featuring exclusive house brews and one-off dishes by Chef Robert Mooney . 18. There’s two new hyper-realistic VR experience at The VOID in Glendale a Ghostbusters themed experience and a scarier Nicodemus: Demon of Evanishment experience. Experiences run on different days, be sure to check their schedule. 22. BOURBON STEAK in Glendale will celebrate National Cheeseburger Day (9/18) and Heritage Bourbon Month by offering diners a gut busting burger special. On Tuesday guests can enjoy a 8oz patty blend of brisket and short-rib topped with red wine onion, mushroom duxelles and bourbon steak sauce, slathered in a Maker’s Mark demi-glace. 23. KCRW’s political show Left, Right & Center returns to The Eli and Edythe Broad Stage to talk policy, the midterm election and more with a range of guests from all spectrums of politics. 24. Every first and third Thursday of the month Brennan’s in Marina Del Rey hosts their famous turtle races. Since 1974, this tradition brings these little speedsters out of their sanctuary (located in the bar) for an exciting game that support charities. Race starts at 9 p.m.
25. Knott’s Scary Farm is back with their signature haunted attractions, mazes and thousands of monsters ready to scare the living day light out of you and your crew. 26. Join New York Times writer Michael Barbaro and friends for “The Daily” live, a special live version of the hit podcast discussing Immigration in the Trump Era at The Theatre at Ace Hotel this Thursday. 27. Third Thursdays on Brand Avenue in Glendale, features music, food, drinks, DIY activities, artisanal vendors and an after hours at the Museum of Neon Art. 29. NoMad Los Angeles will debut its quarterly NoMadic Bartenders series this Thursday with top bartenders from around the world shaking up cocktails alongside the NoMad bar crew from 5-10 p.m. on the Rooftop. 30. The night market at hilltop Asian restaurant Yamashiro back for 2018 every Thursday, from 5 to 9 p.m., through September 27. Angelenos can enjoy a farmers market, freshly prepared foods and Yamashiro’s unbeatable views of Hollywood. 31. Thursday is Game Night at Grand Central Market. From 6-10 p.m. grab dinner and drinks, then head to the Hill St. Platform side and play some ping pong, corn hole, Jenga and much more. 38. Get up close and personal with sharks at the Aquarium of the Pacific during Shark Lagoon Nights. Guests will have the opportunity to touch bamboo sharks and view large sharks in an after hours setting. 40. Pasadena Greek Fest Taste will have guests enjoying authentic food, live Greek music and dancing in a family friendly setting September 21-23. 41. There’s a midnight showing of Hedwig And The Angry Inch at the Landmark Nuart Theatre on the westside this Friday. Greenbar Distillery’s #LoveOurCity campaign wants to feed the hungry and they want Californians to get involved. Through the month of September, you can order a CITY Bright Gin cocktail at 100+ participating restaurants and bars (including at Sake Dojo picture above!). For every drink purchased, Greenbar Distillery will donate a burrito to The Burrito Project. Their goal is to reach 50,000 burritos. See the list of participating spots here. If you’d like to go beyond buying a drink, consider volunteering at The Burrito Project and help prepare and pass out burritos to those in need. The post 41 Totally Fun Things To Do in L.A. This Week You Need to Know About [9-17-18 to 9-21-18] appeared first on .